If there is one problem which can be considered the BIGGEST problem facing our civil justice system, it is DELAY. The crux of our petition is that we have urged the SC to exercise judicial activism to clean its own backyard. 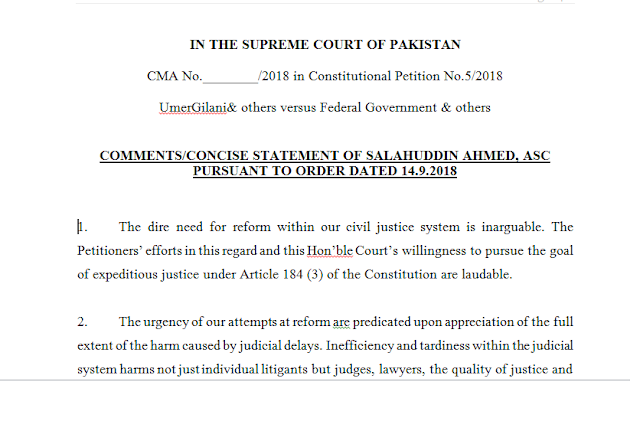 We have pointed out that perhaps, the three most important things needed for defeating delay in the civil justice system are: (i) fixing mandatory time-limits for different kinds of cases; (ii) imposing 'costs' on those litigant and lawyers who cause delay or file frivolous case; and (iii) punishing witnesses who commit perjury, ie submit knowingly false affidavit or record such testimony. Under the scheme of our Constitution, it is the judiciary - and not government or Parliament - which is responsible for doing something about these matters. Please see Articles 202 and 203 of Constitution and S. 123 CPC which delegates power to High Courts to make procedural law and control courts; S. 35 and 35A of CPC (and Costs of Litigation Act 2017) which empowers courts to impose Costs; and S. 195 Cr.PC which gives judges exclusive power to prosecute Perjury. The fact is that thus far the judiciary doesn't have much to show on these issues. We're asked it to do something about it. We're also pushing for data-driven performance accountability of the judiciary. 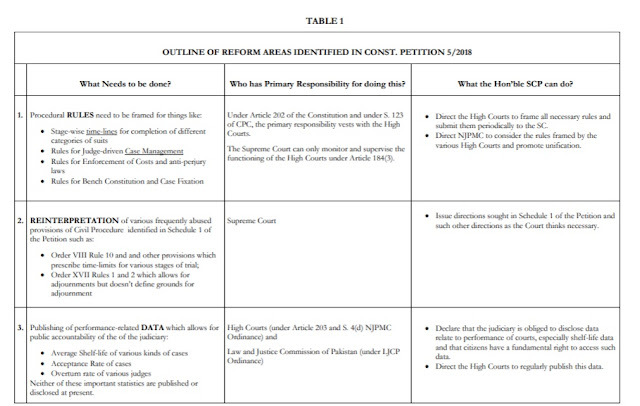 ​The people of Pakistan ​should be able to ​judge the performance of the court system is by looking at ​numbers​. Citizens have a right to know the average time it takes for a case to go from start to end - or shelf-life statistics. At the moment, the judiciary does not collect or publish these numbers. We've urged the judiciary to regularly collect and publish vital judicial statistics. There can be no​ accountability or constructive critique of the judiciary without these numbers. 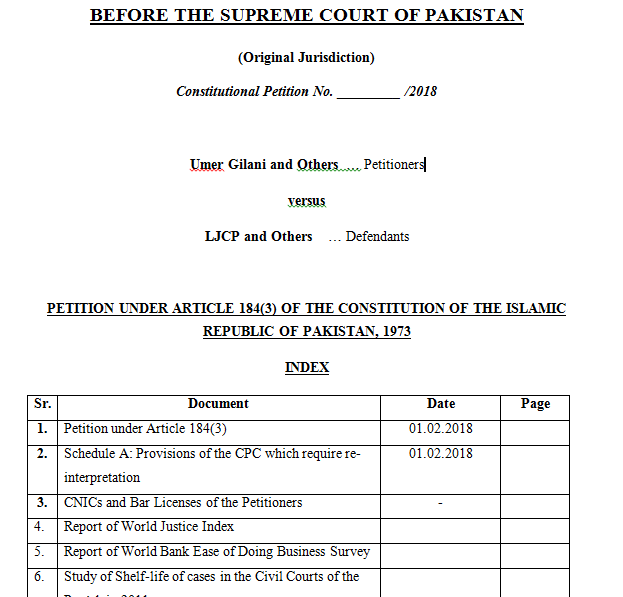 The Petition was filed on 1st February, 2018. In the first hearing on 19th February, 2018, the Supreme Court was pleased to issue notices to all the High Courts and the Federal and provincial governments. However, there been little progress since then. 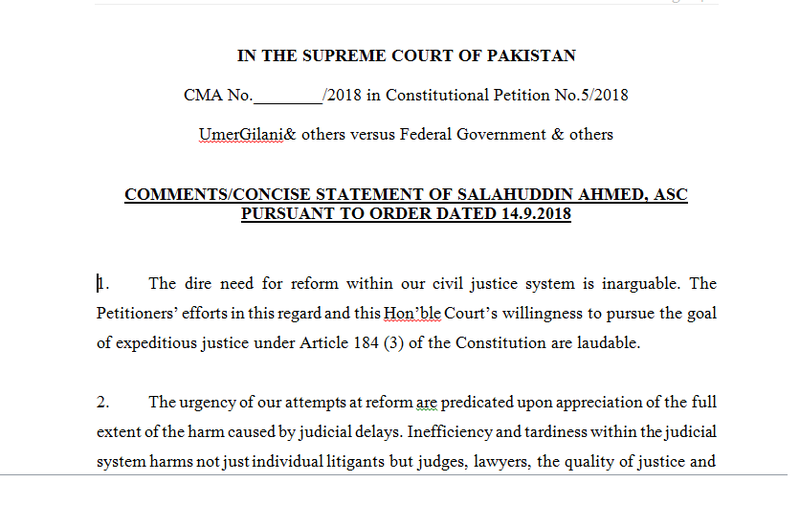 In the first week of October, 2018, Mr. Salahuddin Ahmed amicus curiae has filed a 16-page brief fully supporting the contentions of the petition. 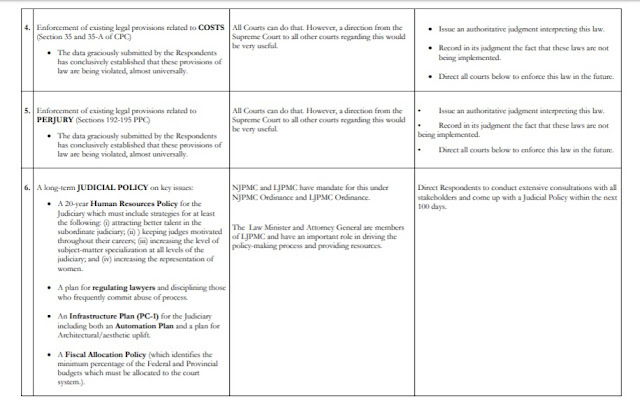 Judicial Activism for Judicial Reform. Op-ed in The News by Umer Gilani. 16th February, 2018.